Ten o’clock this morning. The San Miguel County Courthouse. Telluride, Colorado. For the past couple of days, some festival attendees here had been anticipating a one-on-one between newcomers Carey Mulligan and Katie Jarvis, two young women who’ve broken through this year. Folks joked that the two might duel, or at the very least arm wrestle, when facing each other today. 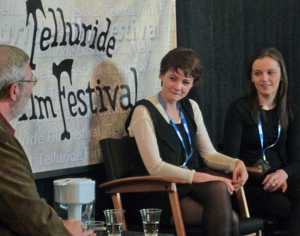 The British actresses, spending the weekend with two different films here at the Telluride Film Festival, are major discoveries of the 2009 festival circuit and come from different backgrounds, but there were hardly sparks between the duo. Carey Mulligan, the twenty-something star of Lone Scherfig’s “An Education,” garnered international attention earlier this year at both Sundance and the Berlinale. Katie Jarvis, the teen who was discovered for a role in Andrea Arnold’s “Fish Tank” while having an argument with her boyfriend on a train platform, was a breakthrough in Cannes but missed much of her moment in the spotlight because she was back home in Britain having a baby. Alternating between both confidence and self-deprecation, with plenty of polish, Carey Mulligan seems to have a twinkle in her eye when she speaks properly and with considerable poise. She’s had a few months to get used to the attention and her career seems to be taking off amidst considerable awards buzz. Contrast that with the more rough around the edges charm of Katie Jarvis, an authentically excited young mom who arrived here late Friday for her first trip to the U.S. She talks with less polish, but quite candidly about how much her life has changed recently. While Mulligan always wanted to be an actress, Jarvis never thought about it. “I was such a loser,” Mulligan laughed today, “I was desperate.” She dreamed of performing some day and got some big breaks before tackling such a big role in “An Education.” So, looking at Jarvis this morning she seemed tickled that the young woman just fell into acting. The two spent nearly hour chatting with Leonard Maltin this morning at the local courthouse here in Telluride. “I felt like it came quite naturally,” Jarvis elaborated about her experience working in front of a camera for the first time. She played a troubled teen from the projects with an authenticity that seems to be drawn from her own life. “The more it went on, the more I enjoyed it,” Jarvis said, her director Andrea Arnold smiling frequently from a back corner of the room where she listened proudly while sitting on the floor. Jarvis admires Keira Knightley and hopes to works with her someday if she keeps acting. “I’d love to carry on, because I really, really enjoyed it,” she said about her potential acting career adding that she’s waiting to see if the right script comes along. She said she hopes to try a very different type of character to challenge herself. “I am looking forward to seeing which other characters I can push myself to do,” Jarvis added. Carey Mulligan, who had both “An Education” and “The Greatest” at Sundance, quickly went right into a role in Michael Mann’s “Public Enemies.” However, all but a few frames of her performance were left on the cutting room floor. Mulligan said she admires Emma Thompson, who guided her in her portrayal of the young woman coming-of-age in the arms of a much older man in the 1960s. She also wants to find challening characters who are more than a main character’s girlfriend or other supporting roles. “They are quite hard to find,” she noted, “I’d like to something really mad and contemporary. I don’t mind thinking that it could be a complete disaster because that could be kind of an adventure!” Next up for Mulligan is a role in “Never Let Me Go,” a new film by Mark Romanek. Asked how they are managing to all the attention from film festival audiences and the media, both young women said they were adapting.